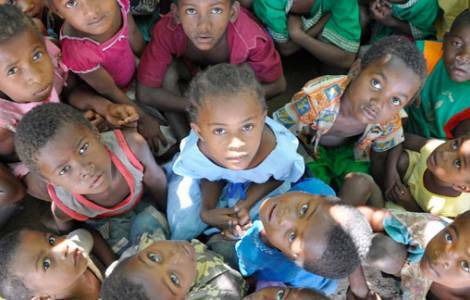 Fianarantsoa (Agenzia Fides) - "To take care of and educate children in order to reintegrate them in their communities of origin": this is the goal of the "Preventorium Rainier III", promoted by the Jesuits Victor Papof and Daniel Ferrero of the diocese of Fianarantsoa. It is one of the social care centers for children with physical malformations, mainly related to rickets, which is located about 3 kilometers from the city of Fianarantsoa. In a note sent to Fides, Sister Christina, of the Carmelite Teresiane Missionary Sisters, director of Rainier III, explains the intent of the center. "The Preventorium - each year hosts 35 to 40 children with physical malformations, suffering from rickets and other malformations. There are also cases that exceed our skills, such as children suffering from cerebral motor diseases that we unfortunately cannot admit". The diocese of Fianarantsoa is responsible for this structure, and among the main collaborators there is the Diocesan Health Center of Ambatomena where hospital admissions, treatments and operations are carried out and the University Hospital Center of Tambohobe. Thanks to these hospitals, children receive specialized care. "What we see in the eyes of the poor, sick and disabled children, is not only the face of Christ who loves them but also the goodness and generosity of those who love and help them", emphasizes Sister Christine.